I reckon that one does not really know Mallorca in all its beauty until one has been to Sóller and Port de Sóller. There are a thousand ways (well, not quite) of getting to that part of the island, a task that not all that long ago proved quite a daunting and challenging one. 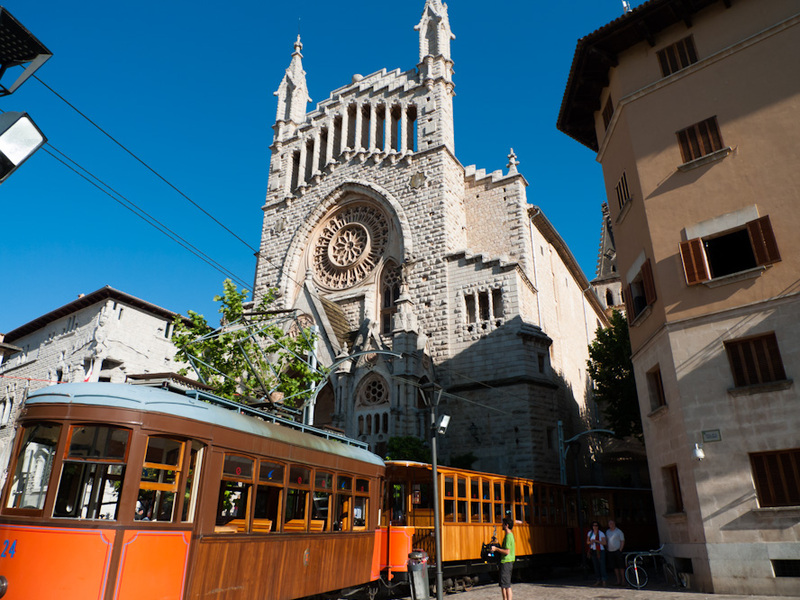 Those of us who have children or even grandchildren, have probably already enjoyed the experience of boarding the Palma to Sóller train, leaving from Palma’s Plaça d’Espanya seven times every day and coming back again, five times (see photo centre). 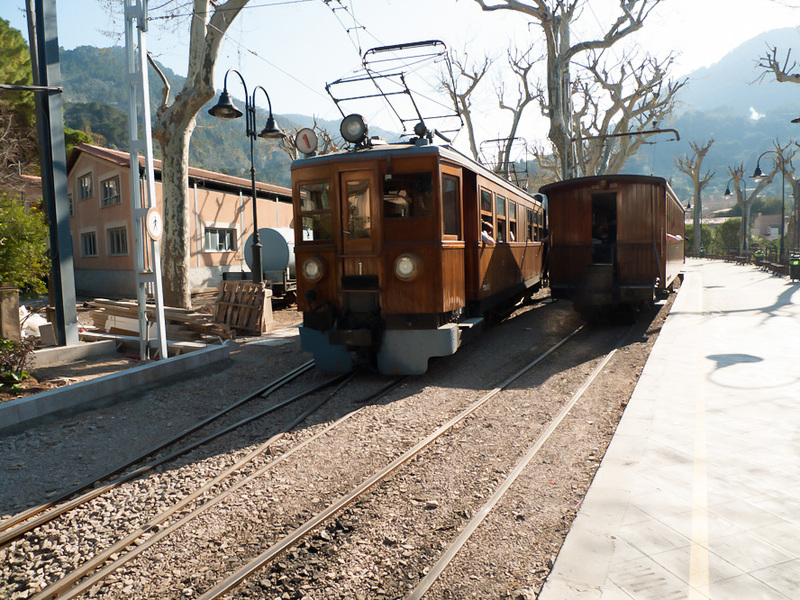 Now would seem like a good time to embark on this journey, as the Tren de Sóller has just completed its first centennial. This trip on the old train and its wooden carriages is like a magic journey to the past. There are no longer any excuses for not boarding the train, even though charges have recently gone up, again, to 19.50 € for adults (14 € for Balearic residents) for the round trip. Up to 1,000,000 tourists take the one hour train ride to Sóller every year, but that should not deter you from enjoying the landscape on the way, especially now when most of the tourists have not arrived on the island yet for this year’s holiday and when temperatures are not hot and scorching. Of course, you could always take the car to Sóller via the tunnel. The Sóllerics more than welcomed the new Sóller tunnel when it was inaugurated fifteen years ago. This new connection cut their travelling time to Palma down from some 60 minutes to less than twenty; not a mean feat when you are going about your daily business instead of, like most of us, going about our leisurely ways. These days, taking the car to Sóller through the tunnel, which starts not far from the splendid Alfàbia gardens, would cost you a fare of 4.80 € (one way). The Sóllerics are not so enthusiastic at the moment at all as they were promised to have their fares subsidised by the Consell de Mallorca, with tolls being paid in full upfront and subsidies being reimbursed at a later stage. However, these subsidies have not been paid for the last 15 months or so. Thus, the tunnel was recently blocked for hours on end in protest against the high charges and broken promises. Be warned that the Sóller tunnel has one of the worst test results on safety standards, according to the British AA, with 39 points out of 100, even though no accidents have ever occurred. 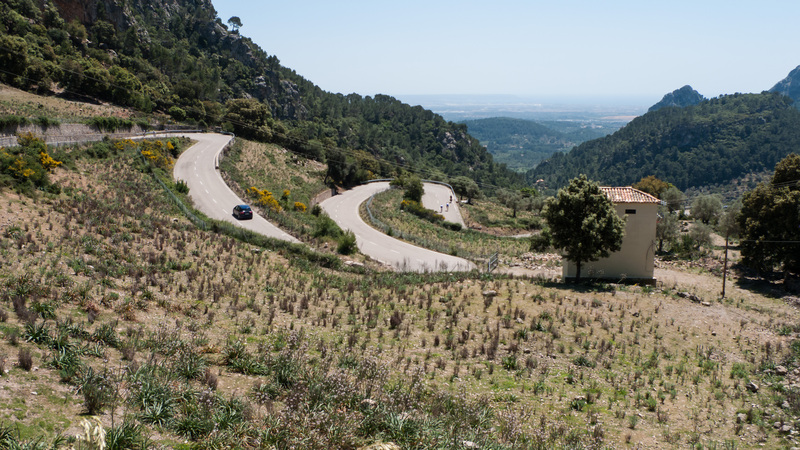 If you want to see Mallorca and one of its most beautiful landscapes, I would like to suggest that you take the road from Palma to Sóller by car, and up into the mountains along that almost alpine road full of serpentine bends at a length of some 14 km. When I went with some friends up to the Coll de Sóller and down again last week (see photo top), there were plenty of cyclists tackling the challenge. Of course, they wouldn’t be allowed through the tunnel, and the mountain climb is a welcome physical endurance test for them as it is. You could also get to Sóller from Port de Sóller by tram. Fares have gone up to the ridiculous amount of 5 € (one way) for the ten minute ride, but still worthwhile at least once in a blue moon (see photo bottom). And you might want to sail from Palma to Port de Sóller, a bit like Junípero Serra in 1749 when he set off from Port de Sóller to Mexico to set up numerous monasteries in Baja California as well as in what is now California, USA. The photos were taken in Sóller, Mallorca, Baleares, Spain. The date: May 14th, 2012. The time was 14:15:14, 17:08:36 and 18:29:37, respectively. It is a beautiful part of your island. I don’t think this adds anything to what you’ve said already about the train, but you never know…. Great post and lovely photos. I haven’t been on the train between Palma and Port de Soller but its on my must do list! Hi!The tramline of Sóller is one of the best tramlines of Europe that,one day,i wait to travel. The photo is beautiful!i like it!Congratulations!it presents the tram number 24,this tram bought by Spain from Lisbon(Portugal),in 1994.I remember to travel in that trams when i was a little boy.This tram was numbered with 700 of CCFL. I recommend a train trip to Soller. Wonderful! I think it takes a few years to visit all offers Mallorca. Thanks for sharing with us your experiences on Mallorca Island.